* Entertain the audience using humour and/or drama drawn from your personal experience. * Organise an entertaining speech for maximum audience impact. * Draw humorous or dramatic material from sources other than your own personal experience. * Adapt your material to suit your topic, your own personality, and the audience. * Use entertaining material to convey a serious message. 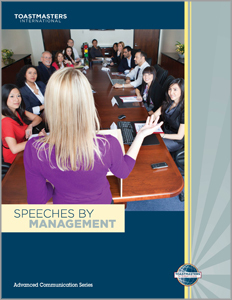 * Prepare a humorous speech drawn from your own personal experience. * Strengthen the speech by adapting and personalising humorous material from outside sources. * Develop an entertaining dramatic talk about an experience or incident, or give a dramatic reading. * Include vivid imagery, characters, and dialog. * Deliver the talk in an interpretive manner. * Prepare an entertaining after-dinner talk on a specific theme. * Deliver the talk extemporaneously; using the skills developed in the preceding entertainment projects. * Select new, useful information for presentation to the audience. * Organise the information for easy understanding and retention. * Present the information in a way that will help motivate the audience to learn. * Analyse the knowledge level of your audience regarding your chosen subject. * Focus your presentation at the audience’s level of knowledge. * Build a supporting case for each major point through use of explanation, examples, and information gathered from research. * Effectively use at least one visual aid to enhance the audience’s understanding. * Prepare a demonstration speech to clearly explain a process, product, or activity. * Conduct the demonstration as part of a speech delivered without notes. * Prepare a report on a situation, event, or problem of general interest to the audience. * Deliver sufficient factual information in your report so the audience can base valid conclusions or a sound decision on it. * Research and organise the thoughts of experts on an abstract concept, theory, historical force, or social/political issue. * Present the ideas in a clear and interesting manner. * Prepare a talk that will build goodwill for your organization by supplying useful information of interest to the audience. * Prepare a positive image of your company or organization on a simulated radio talk show. * Prepare a talk designed to build goodwill toward it by presenting factual information. * Understand the dynamics of a successful radio talk show. * Direct a persuasive appeal to the audience’s self-interests using a combination of fact and emotion in a speech delivered in such a manner that it appears extemporaneous. * Persuade the audience to adopt your viewpoint by the use of standard persuasive techniques. * Prepare a talk to persuade a hostile audience at least to consider your position on a controversial issue. * Conduct a question-and-answer period on the speech subject. * Learn strategies for communicating to the media about a company crisis. * Select a topic for a panel discussion. 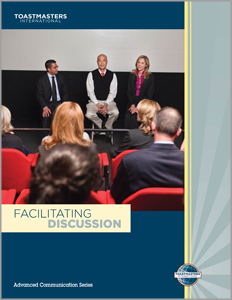 * Identify differing viewpoints to be addressed by panelists. * Organize and moderate a panel discussion. * Select a problem for a brainstorming session for which you serve as a facilitator. * Conduct a brainstorming session. * Have participants reduce the list of ideas to the three best. * Discuss the three ideas generated in the previous project, The Brainstorming Session. * Determine which one best resolves the problem. * Select a problem and ask club members to discuss and resolve it by either a majority vote or by compromise. * Serve as facilitator for the discussion. * Effectively handle any member’s behavioural problems that may interfere with the discussion. * To select a problem for the group to discuss and resolve. * As facilitator, help the group reach a consensus. * Develop an awareness of situations in which you might be called upon to deliver an impromptu speech. * Understand how to prepare for impromptu speaking. * Develop skill as an impromptu speaker by using one or more patterns to approach a topic under discussion; for example, comparing a past, present, future situation before and after. * Identify and understand the basic differences and similarities between inspirational speeches and other kinds of speeches. * Develop a speech style and delivery that effectively expresses inspirational content by moving the audience to adopt your views. * Understand the relationship of sales technique to persuasion. * Identify and promote a unique selling proposition in a sales presentation. * Be able to handle objections. * Understand the elements of oral interpretation and how it differs from preparing and giving a speech. * Learn the preparation or planning techniques of effective interpretation. * Learn the principles of presentation and develop skill in interpretative reading with regard to voice and body as instruments of communication. 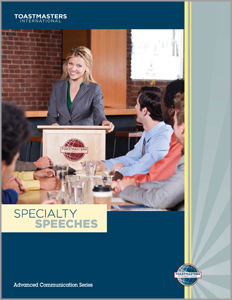 * Focus on the special occasion talk from the standpoint of the introducer (Chairperson, Toastmaster, Master of Ceremonies). 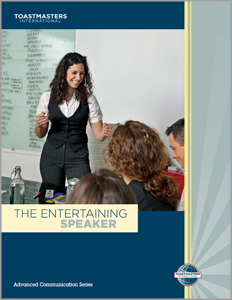 * Become knowledgeable & skilled in the functions associated with the Master of Ceremonies. * Handle the introduction of other speakers at a club meeting. * Develop a speech style and delivery that effectively inspires and moves the audience to adopt your views as a collective reaffirmation of its own. * Understand the nature and process of a technical presentation supported with professional-level visual aids. * Arrange pre-meeting communications via e-mail. * Find or create a post-meeting Web site for further dissemination of information supporting or enhancing your verbal presentation. You may create a Web page and add it to your club’s Web site, making use of podcasting, webcasting, or a basic Internet template. * Use a desktop computer, word processor, a Web browser, a simple graphics program for photos and other images, presentation software as well as the venerable flip chart to support your presentation. * Simulate giving a presentation as part of a video broadcast. * Understand the dynamics of an interview or “talk” show. * Prepare for the questions that might be asked of you during an interview programme. * Present a positive image on camera. * Appear as a guest on a simulated video talk show. * Conduct a successful interview. 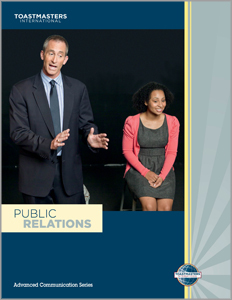 * Understand the dynamics of a successful interview or talk show. * Prepare questions to ask during the interview. * Present a positive, confident image on video. * Understand the nature of a video broadcast press conference. * Present and maintain a positive image. * Learn how to develop and present an effective training programme on the web. * Receive personal feedback through the videorecording of your presentation. * Create and tell a new, entertaining story that offers a lesson or moral. * Understand and use techniques to arouse emotions while telling a story. * Understand the purpose of stories about historical events or people and use the storytelling skills developed in the preceding projects to tell a story. * Identify techniques to use in conversing with strangers. * Recognise different levels of conversation. * Initiate a conversation with a stranger. * Use open-ended questions to solicit information for further conversation. * Use win/win negotiating strategies to achieve your goals. * Enjoy the benefits of win/win negotiating. * Respond non-defensively to verbal criticism. * Use a five-step method to identify the problem, diffuse the attack, and arrive at a solution. * Determine reasons for someone’s substandard performance. * Coach the person to improved performance. * Enjoy the mental and physical benefits of being assertive. * Use the four-step method for addressing a problem and asking for help. * Overcome resistance to your requests. * Recognise the characteristics of a toast. * Present a toast honouring an occasion or person. * Prepare a speech praising or honouring someone, either living or dead. * Address five areas concerning the individual and his or her accomplishments. * Include anecdotes illustrating points within the speech. * Poke fun at a particular individual in a good-natured way. * Adapt and personalise humorous material from other sources. * Deliver jokes and humorous stories effectively. * Present an award with dignity and grace. * Acknowledge the contributions of the recipient. * Accept an award with dignity, grace, and sincerity. * Acknowledge the presenting organisation.